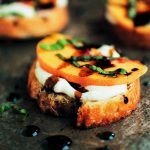 This easy peach bruschetta appetizer has a delicious whipped goat cheese base, balsamic glaze, and fresh basil. 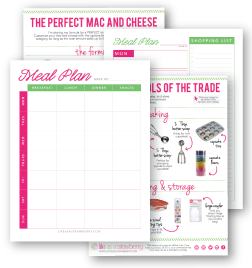 Perfect for summer entertaining or as a light dinner! Vegetarian. I can’t believe we’re already at the end of August. Where did this summer go?! One minute I’m jumping for joy on the first warm-enough-to-wear-sandals day of the year, and the next minute I’m wrapping myself in extra blankets and drinking hot tea while I write a blog post because there’s a sudden distinct chill in the morning air. I’m not ready to be cold again, you guys! In complete denial about summer ending an effort to make the most of my and summer’s last few weeks together, I’m hitting the summer foodstuffs with a renewed sense of purpose. ALL THE TOMATOES! ALL THE SALMON! ALL THE PEACHES! ALL THE CORN! ALL THE ZUCCHINI! 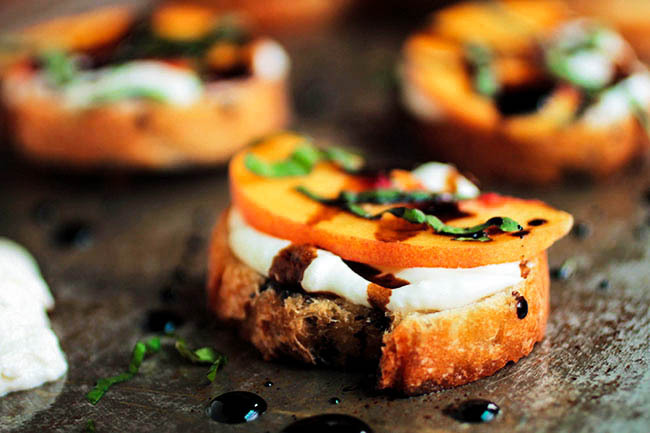 Peaches have been particularly high on my eat-them-all-before-summer-leaves-me list, and this bruschetta is my new favorite way to use them. 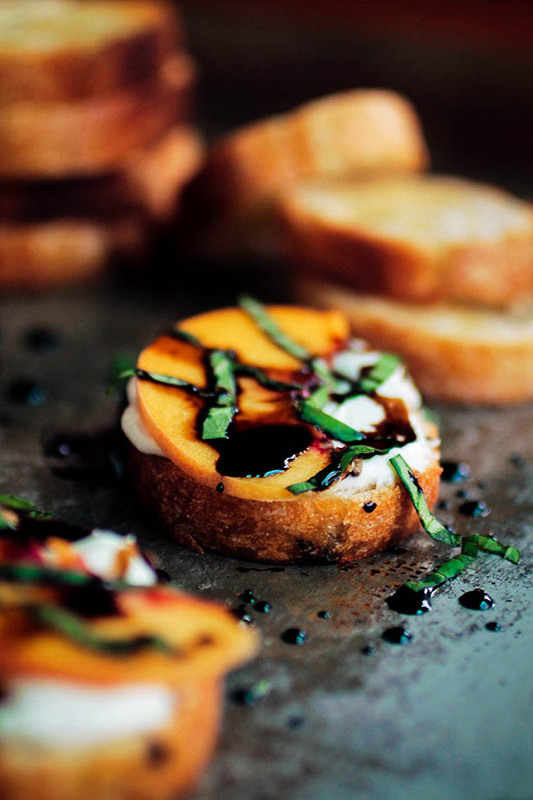 I love the way that peachy, summery sweetness stands out from the whipped goat cheese (DID I MENTION THERE’S WHIPPED GOAT CHEESE) and the balsamic vinegar. And let me just take a minute to talk about the magic that is whipped goat cheese. Have you tried this yet? Because I am obsessed with it. (As if I could be any more obsessed with goat cheese, right?) It’s so perfectly spreadable. I’ve been eating it on everything. Ahh! Magic. But this bruschetta. Let’s get back to it. 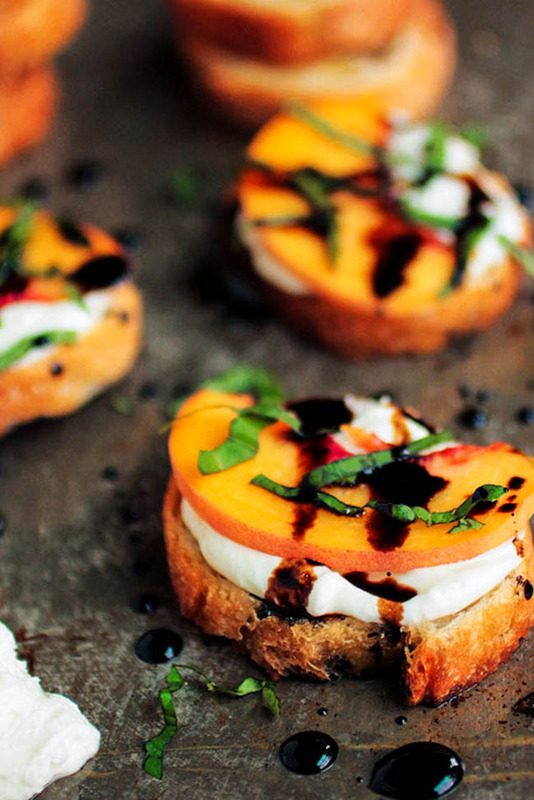 It’s a fun change from traditional tomato-mozzarella bruschetta, and the colors of the peaches + basil + balsamic together against a cheesy white backdrop make my color-lovin’ soul exceedingly happy. It’s the perfect app for your end-of-summer barbecues (also, the perfect comfort food for your end-of-summer denial about the end of summer). How to Make Whipped Goat Cheese – the Video! 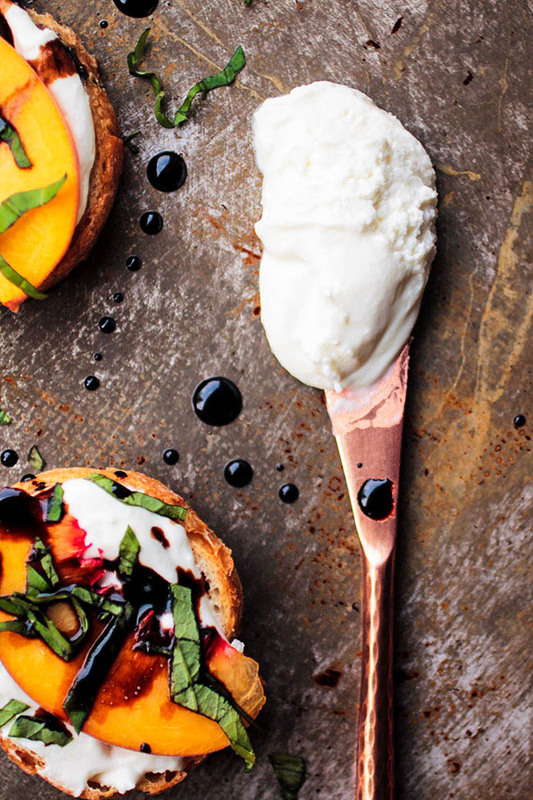 A simple summer bruschetta recipe with peaches, goat cheese, and balsamic glaze. Crumble goat cheese into the bowl of a food processor and add cream cheese, salt, and pepper. Pulse until everything is combined and you have a smooth, creamy cheese. Put whipped cheese in an airtight container and store in the fridge until you’re ready to use it. Lay baguette slices in a single layer on a large baking sheet and drizzle with olive oil. Bake at 375 degrees F for 5-8 minutes until bread is toasty and lightly browned. Put balsamic vinegar in a small saucepan over medium heat and bring to a low simmer. Simmer for 5-7 minutes until vinegar has reduced to a thick syrup-y consistency. Remove from heat and set aside. To assemble, spread a spoonful of whipped goat cheese on each baguette slice, then add a small pinch of salt and fresh ground pepper to bring out the flavors. Top cheese with one or two peach slices and a pinch of fresh basil. 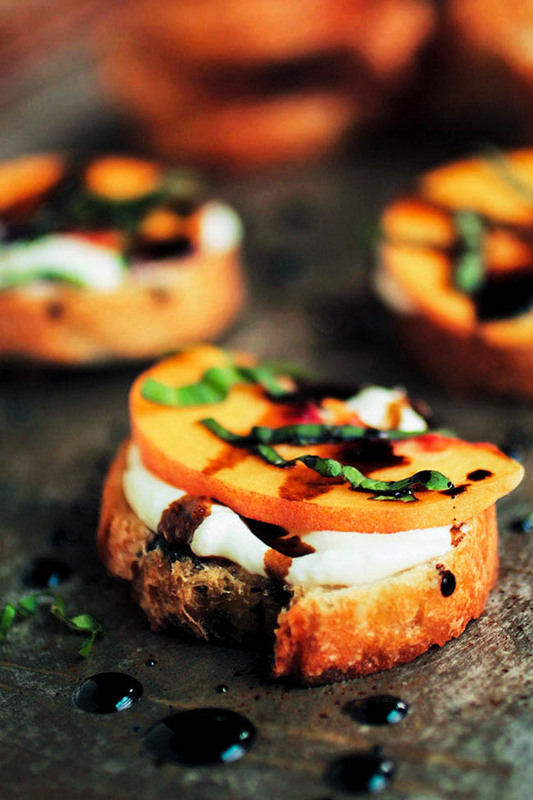 Drizzle a bit of the balsamic reduction over the bruschetta and serve immediately. Can the cheese mixture be made in advance? If so, should it come to room temp before spreading it? Could i use thawed frozen peaches? 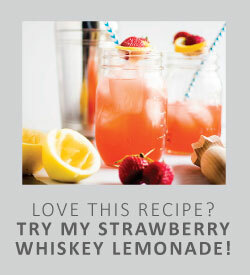 I haven’t tried it with thawed frozen peaches (I tend to prefer the taste of fresh peaches when they’re in season) but you could certainly give it a try! I’m really excited to try this when peaches are ripe again-can hardly wait. I’m thinking that I might grill the peach slices first-have tried that in other recipes and it’s divine. Wondered if you’d tried this recipe using grilled peaches? Grilled peaches are AMAZING here – I highly recommend giving it a try! I made this and OMG !!!!!!!!!! Wahoo! I’m so happy you liked it – thanks for letting me know how it turned out!